Protect your investment by replacing rotted and worn out wood before the winter months arrive. Rotting wood should be replaced before additional structural damage is caused by water infiltration into the home. At Harbor Paint we employ the best solutions for making repairs and replacements for rotted wood on trim, fascia, rakes, sills and soffits. Wood that is located less than eight inches from the ground should be replaced with rot resistant wood (cedar or PT) or today's revolutionary PVC materials such as Azek. Azek looks like and is installed the same as the existing trim wood and can be painted to match any color scheme. Other areas that tend to rot easily or show signs of carpenter bee damage or wood pecker damage should also be replaced with a PVC product making the repair permanent. Sections of wood that have minor damage can be repaired with an Epoxy compound especially formulated for exterior use. This type of "filler" does not soak up water like typical less expensive wood fillers used by inexperinced trades-people. Selecting the proper materials can ensure that susequent painting life is enhanced on these failure prone areas. 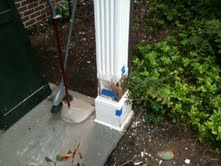 Consider the overall costs of all repair options so that repairs are permanant and seamlessly integrated into the home. Avoid the temptation of using "finger-jointed" or common pine that tends to fail in as little as two years causing the repair process to be repeated.